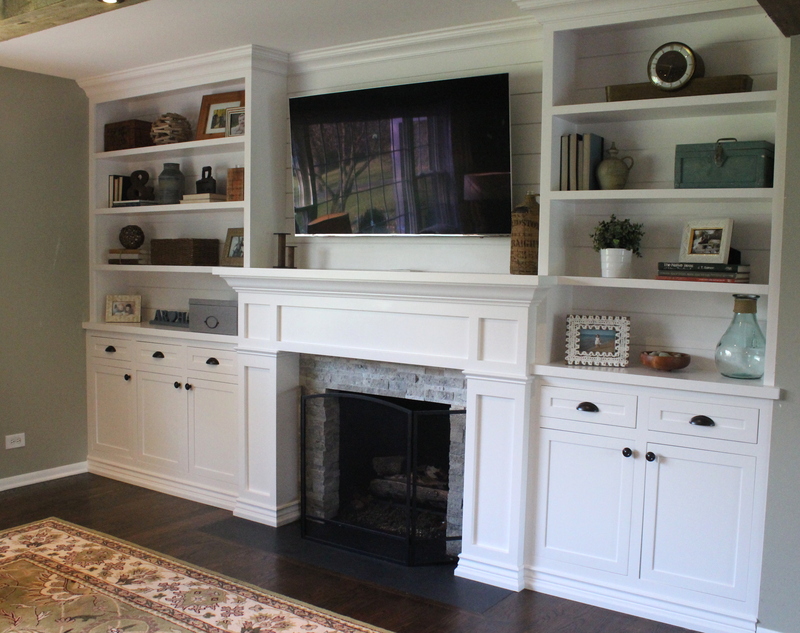 Big Reveal: Living Room Built Ins! 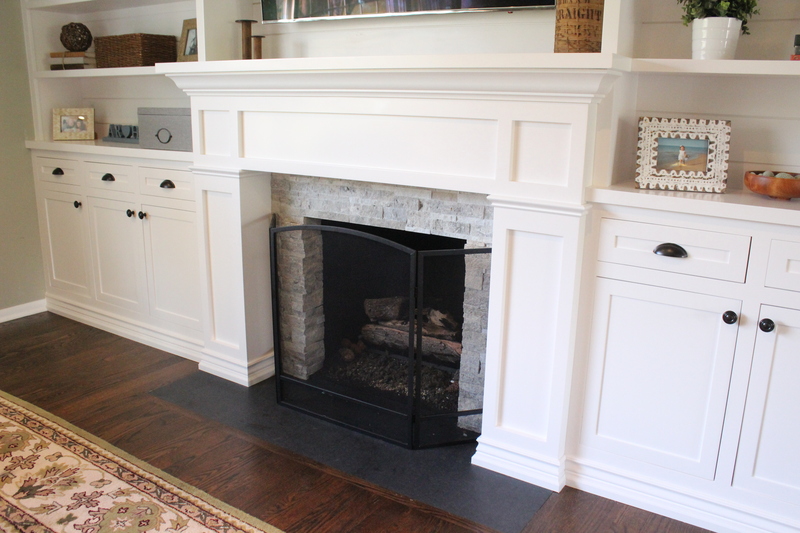 Since the last update we installed a honed black granite hearth to replace the dated tile. 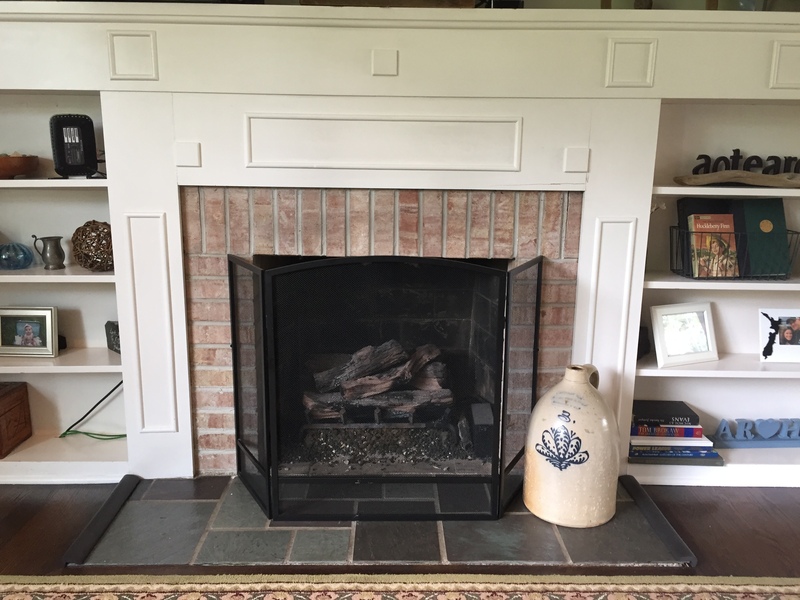 Next we installed Tile Shop’s Claros Silver stacked stone on top of the existing brick. 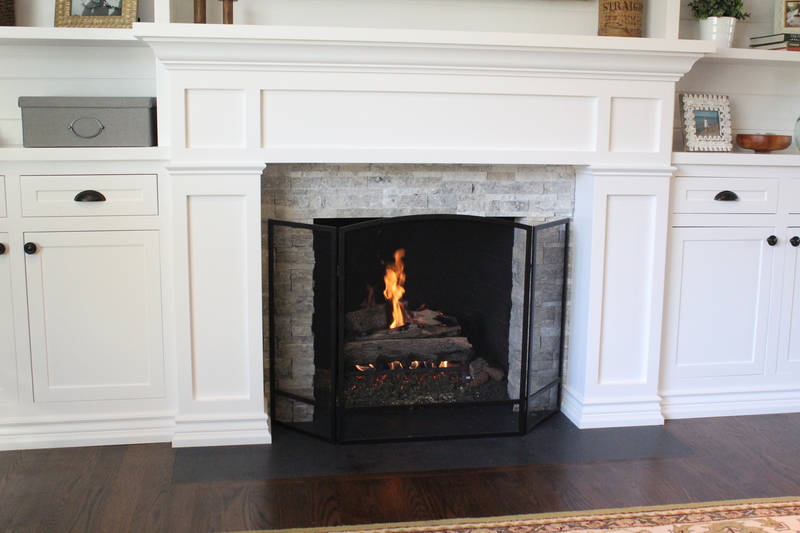 We used the same fireplace screen and gas log set as before. 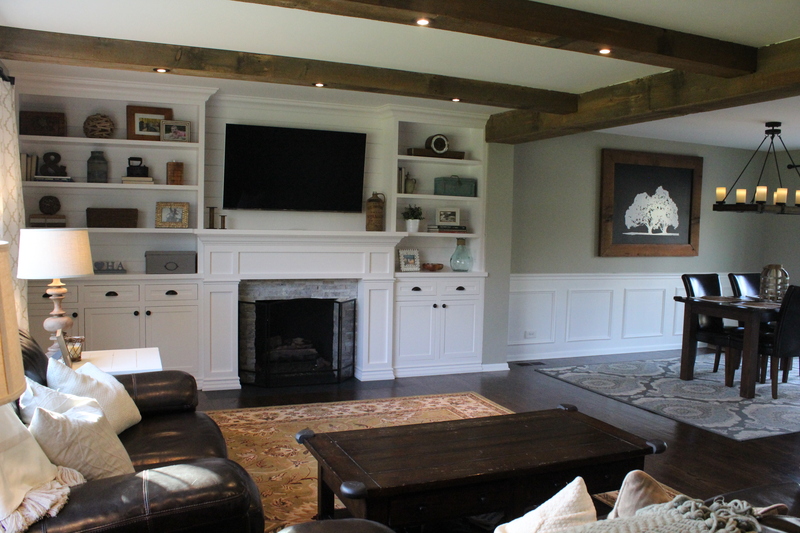 Ben also installed a switch on the right side of the built ins so we can easily turn on the gas fireplace. 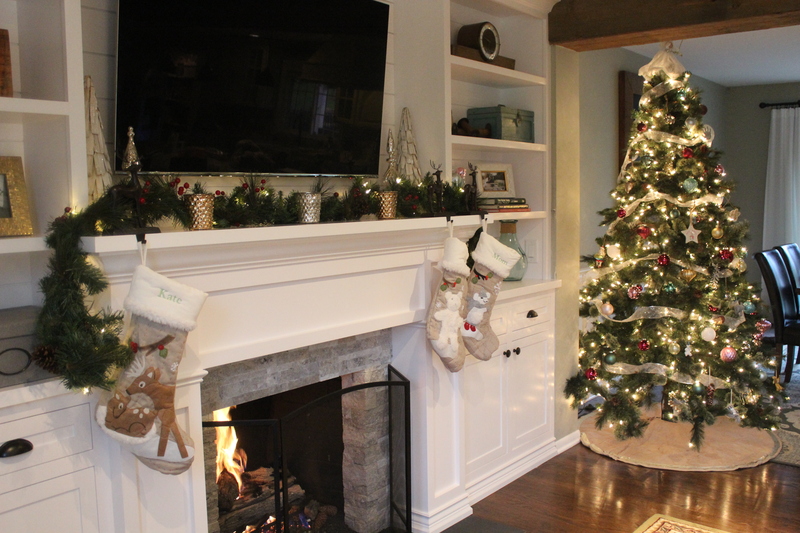 Here’s a look at the fireplace turned on, so warm and cozy! 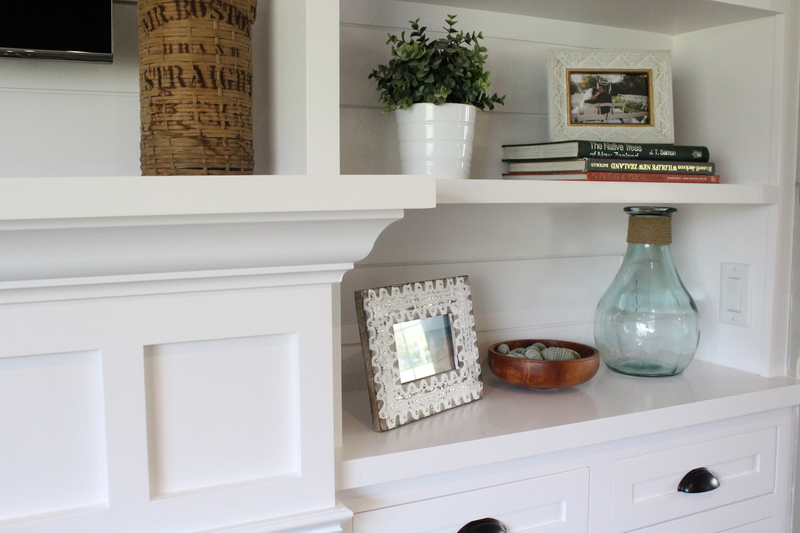 The cabinets are painted a crisp, clean white called Chantilly Lace by Benjamin Moore. 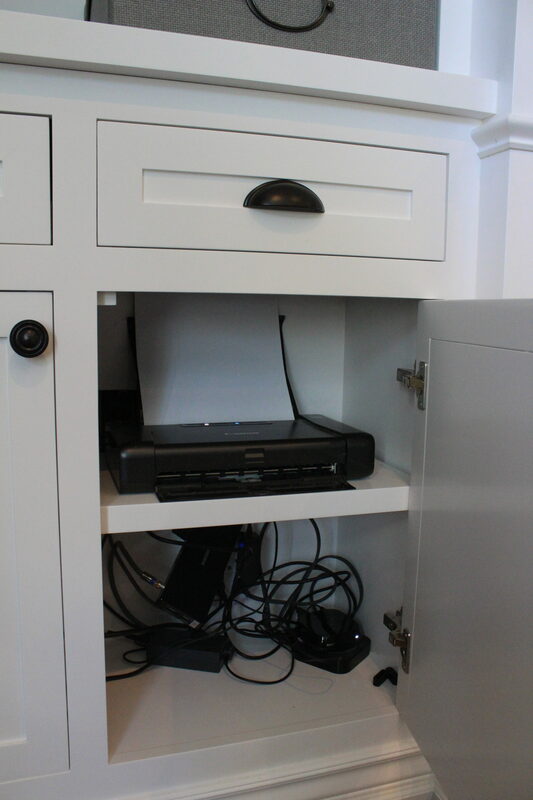 We chose oil rubbed bronze hardware and found the cup pulls from ATG Stores and the knobs from Home Depot. Ben installed a chase behind the TV so all our cords are hidden in the wall and the components and our printer are in one of the cabinets. The closed storage is great; we have board games, serving dishes, office supplies and more in there. Way more functional than the open shelves before. Here’s another view farther back. 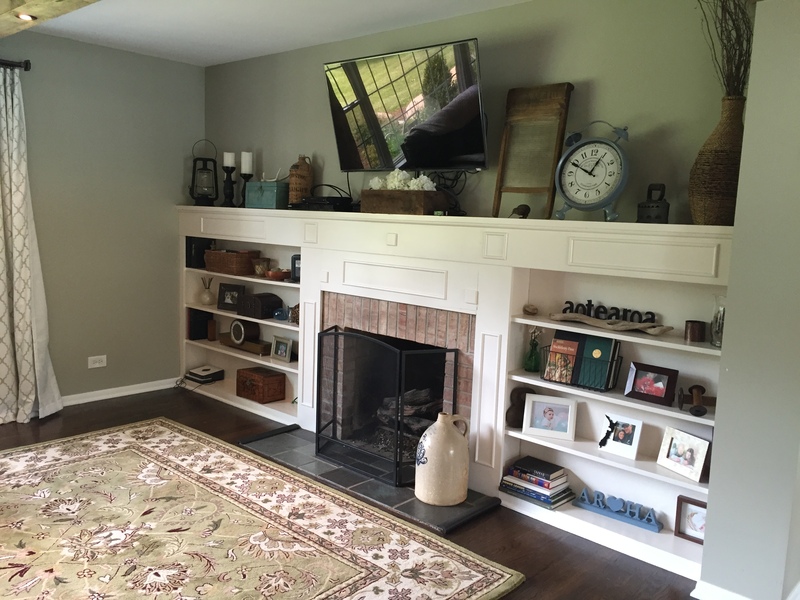 You may notice the fireplace isn’t centered so there are more cabinets on the left side. 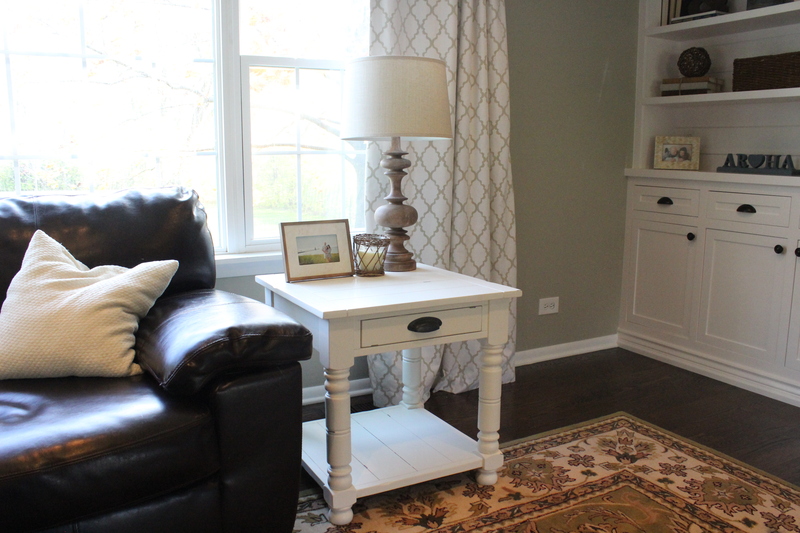 That side table is relatively new from Chip and Joanna’ Gaines new line of furniture at Value City. And the table lamp is also new from Target (on sale here). 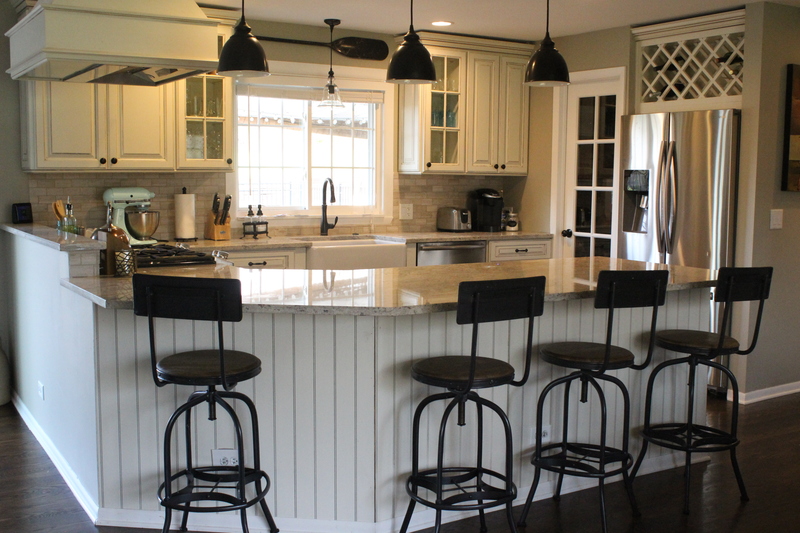 We also installed beadboard on the kitchen peninsula. 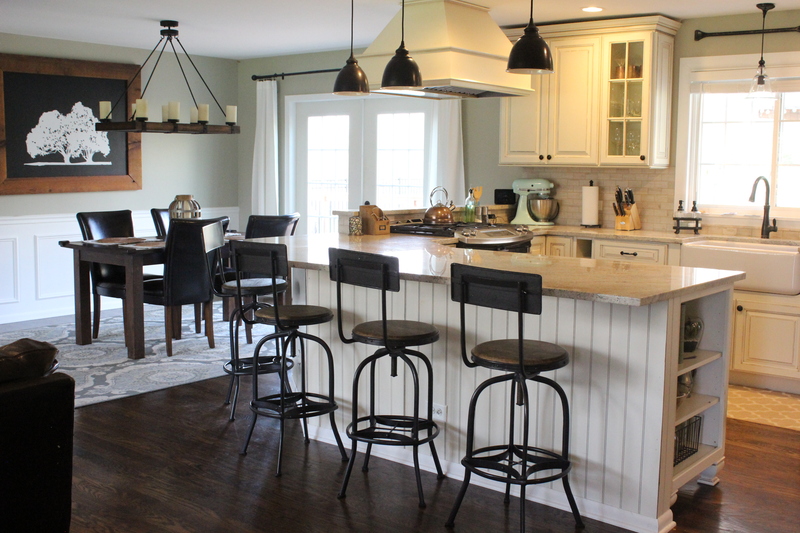 The kitchen stools are from Ballard Designs. 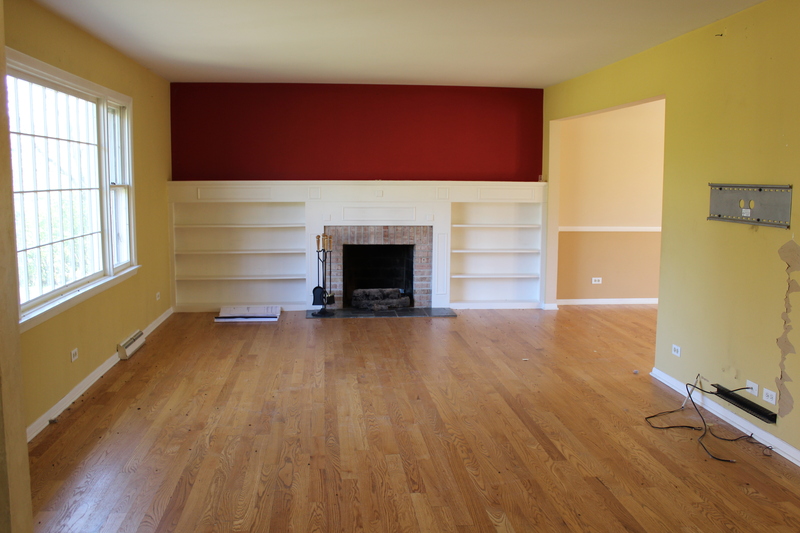 Here’s the other side of the living room looking toward the front door and the playroom through those french doors. The rug is from Home Decorators or Amazon here. 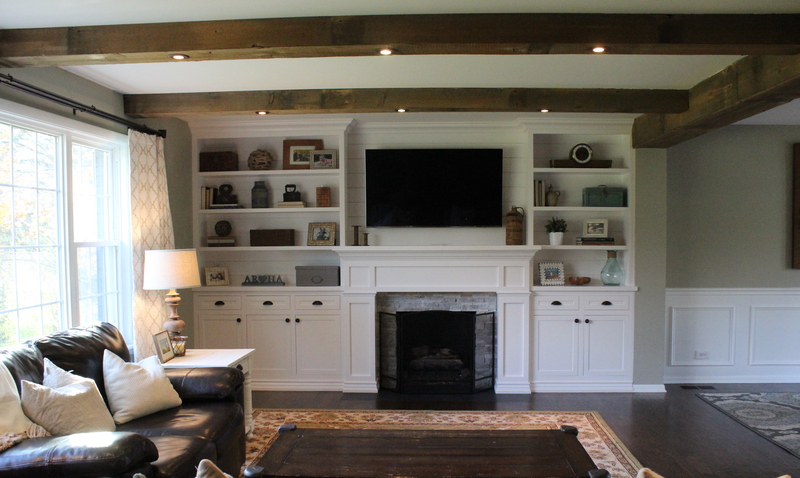 You can see how we created the barn wood beams here. 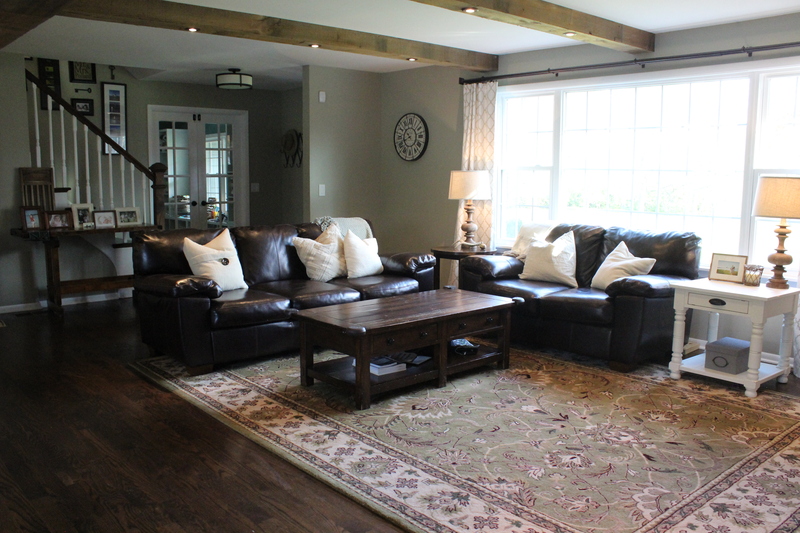 Hooray, this is one of our last major projects inside the house (for now). Now all our focus is on the “flip.” Update on that to come soon. Love it!! 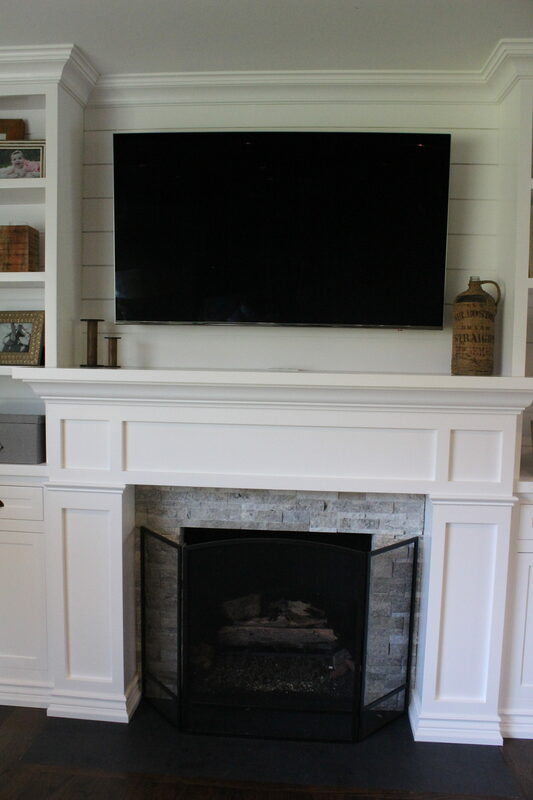 Great job on the new fireplace built-in! 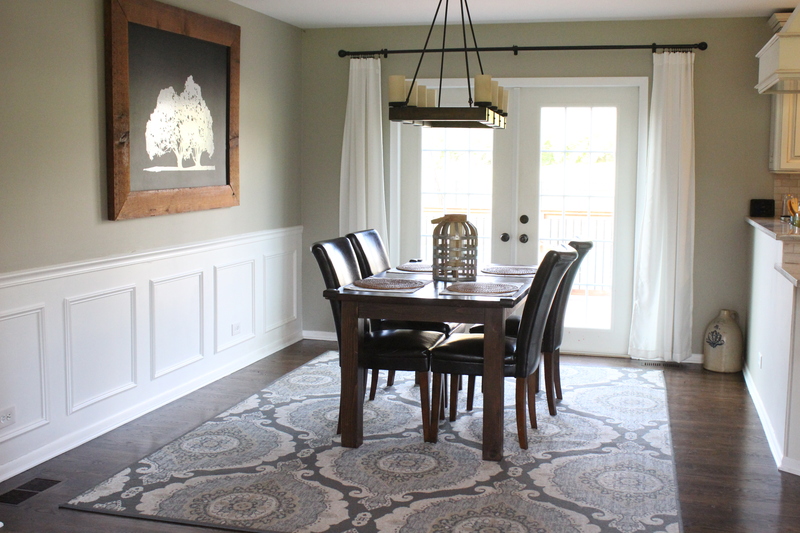 Did you use Chantilly Lace by Benjamin Moore for your baseboard trim and wainscoting in the dining room? 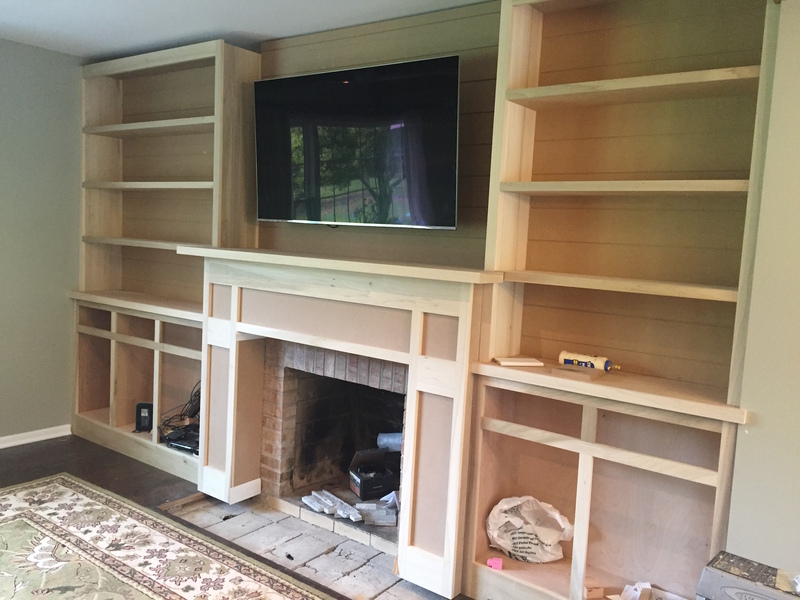 We are starting to make the switch from honey oak to white trim. 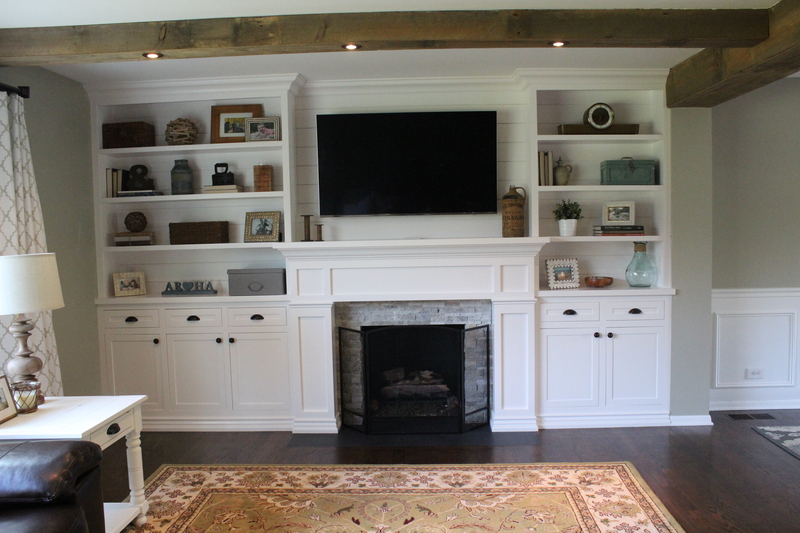 I’m looking for a crisp white paint color. Simply White is a bit too much cream. Is it satin or semi-gloss? ..and it’s Benjamin Moore, not color matched? Thanks Doreen. For the dining room we just used off the shelf white from Behr. But I think the Chantilly Lace would work well for your trim. Satin. We try not to color match. Thanks Amanda! We went with Polar Bear by Behr in satin. I primed and painted some trim today, so far so good. Your house is beautiful and you two are amazing! No one would recognize it as the same house. Exciting can’t wait to see it! Love this so much!! 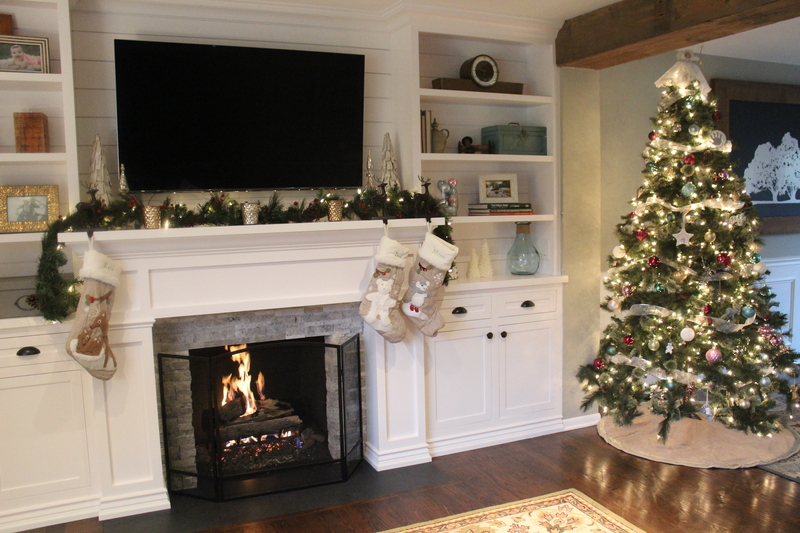 I would love to do this but am not handy can you tell me how many inches high the mantel is from the floor? ?